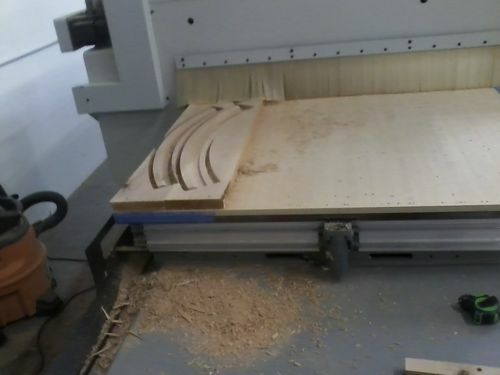 I was sharing some news from work on the Stumpyville thread and thought I’d pull it over here for the CNC geeks to enjoy…. 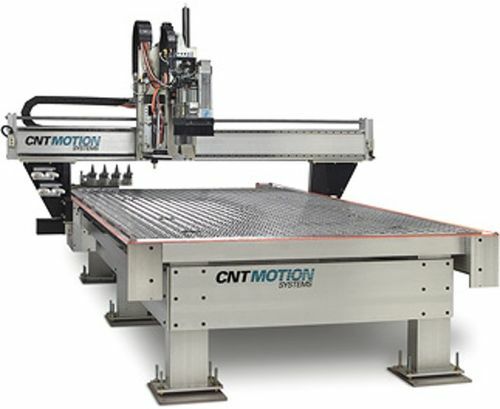 I’ve been swimming in CNC router specs and features and minutia details about their inner workings. I’m dealing with some very knowledgeable sales people and feel like I’ve learned a TON in two weeks. One guy told me “very few customers ask these type of questions” and I took that as a compliment. My boss has the final decision, but says he will lean heavilly on my recommendation, so I don’t want to screw it up. As much as I love this stuff, I’ve been staying late every night and am getting a bit burned out by it all. What I really want, is to build a garage and park one of these bad boys in it, hang out a shingle and play. I was curious Matt, ..... if industry looked at the same companies that we woodworkers look at. I used to hang out on CNCZone & WoodWeb, and there are certainly active companies doing great work with machines like the Luguna or ShopBot. I think the big difference is the duty cycle and the productivity features. 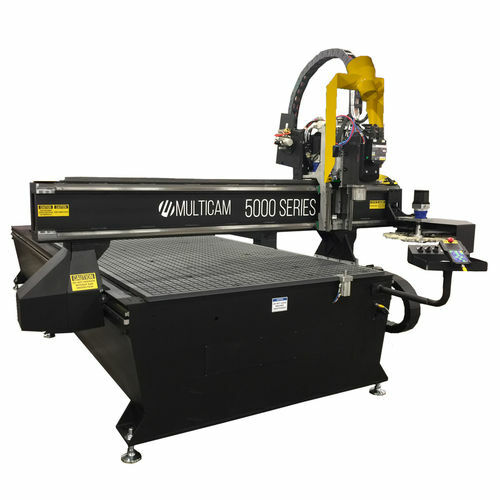 By way of comparison, our MultiCAM DT5000 weighs 8,500 lbs (rigging it into the bowels of our foam shop requiered two fork trucks and some head scratching). Here were my minimum specs that every machine considered had to meet at a baseline. Note that all of these machines require reliable (no convertors) 3 phase power, and in abundance. Automatic tool changer with ≥ 8 tool holders. Highly effective dust collection system. A robust and rigid frame. The Onsrud machines start around $85K the last time I looked at them – I ve used several different versions. Fairly reliable if you get the upgraded controller. It would seem that your boss is liking making money with the machines he s got and could be looking for the BBD (Bigger Better Deal). How exciting. I know you know your stuff and appreciate you chiming in. We bought our last machine (CNT 900 series) used (but very lightly so) back in 2010 and got a smoking deal on it. And it’s still chugging along…. In my experience there’s three different flavors of used. 1. Company went belly up in a bad economy and sold a great machine that they didn’t want to lose. But the economy is so good right now that these opportunites aren’t popping up. 2. Company has rode the machine hard for years and is just starting to encounter significant down time and maintenance expenses. These have a high risk of being maintenance headaches. 3. Company realizes that they bought the wrong machine and wants to upgrade… but I think these usually get traded in. ONSRUD certainly makes a top shelf industrial machine, but the ones I’ve seen were a couple steps above what I perceive our needs are. We’re far enough down the road that I don’t think I want to bring in another company. I evaluated 5 machines from three companies and feel we got a pretty good lay of the landscape. Our experience is that we spend more time clearing the table and loading the next sheet than we do running the programs, so we’re looking into two cool features that should really ramp up our productivity. 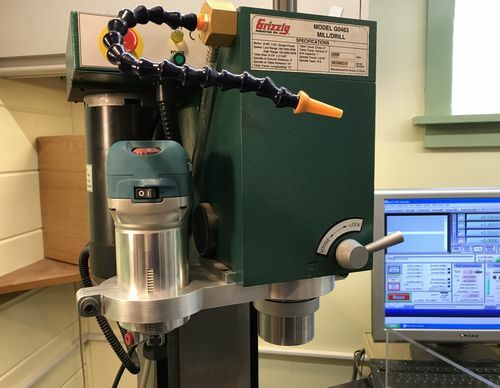 Though we have decent DC in this shop, the CNT900 is an 15 year old “mid-tear” machine and the DC attachement is “iffy” (4” line offset from the spindle head). 1. A table sweep/rake. This is a snow plow like beam that is moutned to the gantry. 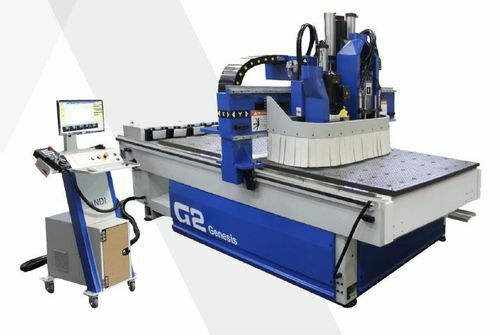 After the program is done, the gantry retracts to end, drops the sweep and the moves the lenght of the table, pushing the parts, scrap web, and a lot of the debris off the other end. The better designs have DC buiilt into the sweep, so the table is also vacuumed clean of any dust and chips and is ready to load, with no operator action. 2. An integrated off feed conveyour. Giben has a very reasonably priced accessory conveyor table, with integral DC that collects the dust scraped off the table by the sweep and moves the parts and scrap web out of the way. The goal is that the operator can immediately load the next sheet and hit play, and then go stack his parts and toss the web in the hopper while the program runs. This setup is on a G4, with auto-sheet feeding… which we’ve ruled out…. but the table scrape and off feed converyor are the same as the G2 we’re considering. FESTOOL MAKES THE BEST CNC! Used Machine scenario #4; Large national manufacturing company has six machines in two separate buildings for more than a decade. Owner is approaching retirement age and gets an amazing cash offer that’s too good to refuse for the rather large parcel of real estate his buildings are on. He buys a new, smaller property and builds a single massive building to consolidate his operations in. He figures he can sell off, rather than pay to move and re-set up, the least often used machine and not be any worse for wear. Hence, a 12 year old machine with about 2 or 3 years worth of use on it. P.S. I’m glad I avoided scenarios 2 and 3. That’s Okay Matt, I was just teasing ya’ about the name thing. My CNC build is in limbo for a few years now. Ever since I had a couple of heart attacks about 4 years ago, that project got re-prioritized near the bottom of the list. I keep looking at it and thinking it is time to jump back into it. I have a mental checklist of the things that need to happen to finish it. Sadly, I want to take it apart a re-do several things. It may still happen. For now, work keeps me full-time busy and I have lots of fun tools to play with lately. My CNC build is in limbo for a few years now. Ever since I had a couple of heart attacks about 4 years ago, that project got re-prioritized near the bottom of the list. Ouch… didn’t know that (or if I did, I spaced it). Hope you’re recovering well. Stints? I’m getting to the point that I know a fair bit “about” CNC routers, but I rarely ever get to play with them and when I do, it’s simplistic 2D geometries. I’d really like to get a seat of Aspire and do some full blown 3D contour cutting and V-carving…. but alas, there’s only so many hours in a day, and like you, I need to work to pay da bills (and have two kids in college bleeding me dry). Maybe I’ll be able to try some more difficult stuff now that I have a palm router slave spindle set up on my CNC mini-mill. No stints, but some permanent damage that slows me down a lot. It’s been quite the adjustment. 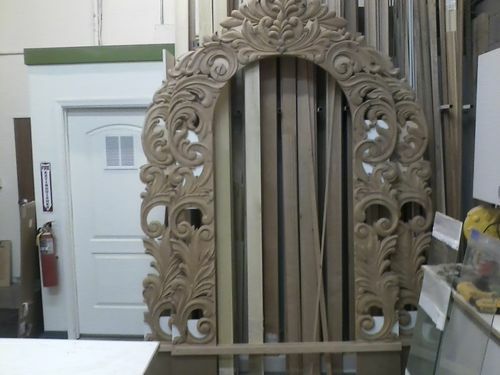 Here’s a curent CNC project; Custom arched casings/door jambs. These are the moldings in the transition from the carvings to the jamb. Rough-in of the blanks was done on the CNC, the final carving done by a local carver. Still working on the plinths and the jamb – going into forms today. Maybe I ll be able to try some more difficult stuff now that I have a palm router slave spindle set up on my CNC mini-mill. Did you make that custom mounting bracket for the router? Designed it and cut it on the mill from 3/4 T6061. Then took it to work and used a slitting saw to cut the slots, drilled and tapped, etc… on the Bridgeport clone. Love the arch and carving… Do you rough that in with a ball nose cutter? 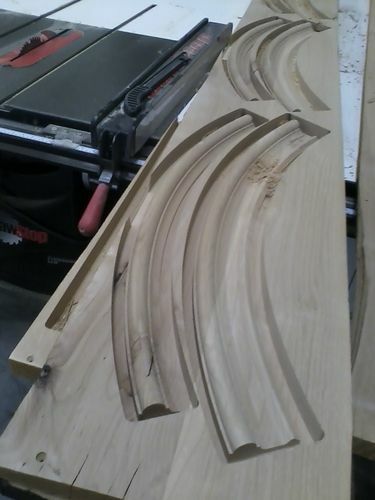 The screen to machine is basically Alphacam Router, so the moldings weren’t too hard. Maybe someday the carvings will come along on the CNC.